Apple has finally released the full and final version of Mac OS X Yosemite 10.10.5 (Build: 14F27), OS X Server 4.1.5 (Build: 14S1136), Safari 8.0.8 for OS X v10.10.4+ (Yosemite), Safari 7.1.8 for OS X v10.9.5+ (Mavericks), and Safari 6.2.8 for OS X v10.8.5+ (Mountain Lion) with Security Update 2015-006. The official Direct Download Links of OS X 10.10.5 Final and OS X 4.1.5 Final Setup and Delta / Combo Update .DMG Files for Manual Installation Using iTunes is available. The latest OS X Yosemite 10.10.5 for Mac changelog includes; fixes for DYLD_PRINT_TO_FILE vulnerability, improvements for Mail, Photos, QuickTime Player, Bugs fixes etc. You can read more in below image! The newest OS X Server 4.1.5 for Mac release note contains; support for OS X 10.10.5, MDM command improvements, stability, security, performance fixes etc. Find more in image below. 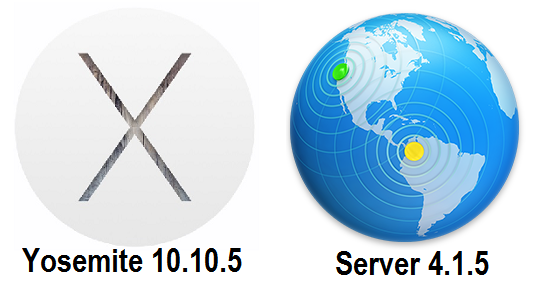 How to Install OS X 10.10.5 and OS X Server 4.1.5 Updates? If you're already running an old OS X Yosemite v10.10.x and OS X Server v4.1.x operating systems, then head over to Mac App Store >> Software Update option for instant official updates. Mac OS X Yosemite 10.10.5 Final Version (14F27) is compatible with OS X Snow Leopard 10.6.8+ or later Mac operating systems, and also support different multiple languages i.e. English, Arabic, Catalan, Chinese, Croatian, Czech, Danish, Dutch, Finnish, French, German, Greek, Hebrew, Hungarian, Indonesian, Italian, Japanese, Korean, Malay, Norwegian, Polish, Portuguese, Romanian, Russian, Slovak, Spanish, Swedish, Thai, Turkish, Ukrainian and Vietnamese. Mac OS X Server 4.1.5 Final Version (14S1136) is compatible with OS X Yosemite v10.10.5+ or later, and support nine multiple languages i.e. English, Chinese, Dutch, French, German, Italian, Japanese, Korean and Spanish. All Mac OS X general public users can manually install OS X 10.10.5 using Bootable USB or Bootable DVD through iTunes. Free Download OS X Yosemite 10.10.5 DMG and OS X Server 4.1.5 DMG Files via Direct Links below. Click Here, to read Apple guide and tutorial.